On this score at least you cannot fault Narendra Modi. He is fulfilling the election promise made by his party to launch bullet trains in India if voted to power. With Japanese Prime Minister Shinzo Abe offering extremely generous terms of funding for the Shinkansen, as high-speed bullet trains are called in Japan, the first of these monstrously expensive trains may be zipping between Mumbai and Ahmedabad some 8-10 years down the line. The question is why. A quick check of the Mumbai-Ahmedabad sector reveals a disproportionately high pampering of travellers commuting between these points. With 62 trains running between these cities in addition to another 11 that are termed ªcircle trainsº, this is clearly saturation rail coverage. What the bullet train will do is cut travel time on the 505-km route from seven to two hours. Remember the average speed on India’s creaking lines is just 54 km per hour. Building the first bullet train will cost $14 billion, working out to a staggering $28 million per km. Because of the eye-popping figures, most analysts have contended themselves with examining the viability of the project with hardly any concerns being raised about the need for such high-speed trains in India. Some have pointed out that the train will traverse the major industrial cities of Surat and Vadodara and may thus benefit workers. Hardly. The fares the bullet train will charge will not suit the pocket of workers. But it is quite possible that middle-rung businesspersons and traders who seem to prefer upper class train travel to flying will benefit from it. Doubtless, another lot will also find the train useful—stockbrokers. Remember, the Bombay Stock Exchange is setting up an international exchange in the Gujarat International Finance Tec-City (GIFT) in Gandhinagar. Otherwise, the bullet train is an extravagance that India can ill-afford even if the terms of the $12 billion Japanese loan are more than generous. Abe, keen to export the Shinkansen trains, is offering the soft loan at an interest of just 0.1 per cent, with repayment spread over 50 years. A further sweetener is a 15-year moratorium on repayments. This could have something to do with Japan’s determination to outbid China on high-speed rail projects worldwide after it lost out to its rival on an Indonesian contract. In September, China won the contract to assess the feasibility of a high-speed train between Delhi and Mumbai. It is early days yet to ascertain if the Chinese would be willing to fund the 1,200-km project. Verily, the Mumbai-Ahmedabad may turn out to be a one-line wonder since it is unlikely that other successful bidders would be able to match the terms of the Japanese. Should India look askance at such a generous gift from the Japanese? And should critics cavil at such an ambitious project? There are several reasons why one needs to ask hard questions about the far from democratic priorities outlined by the Prime Minister for Indian Railways. Modi has an unabashed hankering for the bullet train, much like a child desiring a top model toy train, and it is unlikely he can be denied or diverted. But is the Railways as fascinated by the high-speed train? From the rather tepid reaction of officials, it would appear that not all are sold on the idea. Some are asking whether the railways should be committing all its resources to a single high-speed line when its creaky network is crying out for improvements on safety and speed. It’s a staggering task because Indian Railways moves 23 million people across the country every single day, but at an average speed of 54 km per hour. And let’s us not even begin on the issue of cleanliness and lack of basic toilet facilities in most trains. 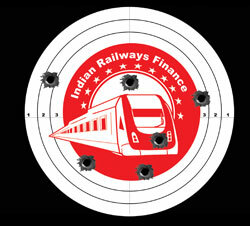 Modi’s elitist pet project could well turn into a bullet ripping through railway finances.